Just a cool old Corvette! 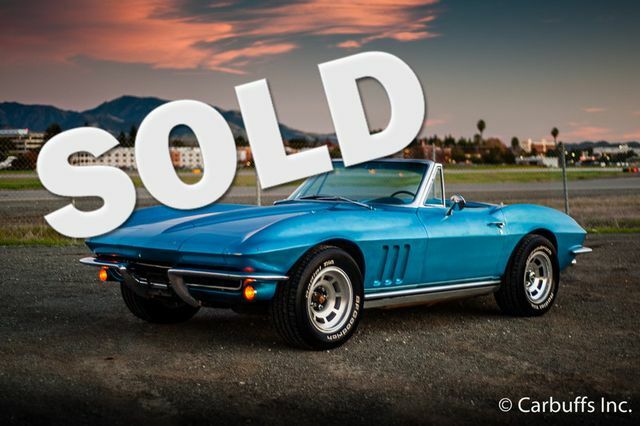 The seller inherited this car from a very good friend of his upon his passing in 2008. He had been friends with the owner since the early 1970’s. The friend bought the car locally here in Concord in 1967. There is a great deal of notes and receipts concerning the car going back to 1970 and registration information back to 1967. Luckily, the longtime owner had a habit of noting nearly everything he did to the car including dates and miles. The car had the flares put on and the paint done in the late 1970’s. The owner had the foresight to keep the pieces of fiberglass that were removed during that process that look to still have original Nassau blue paint on them. The paint on the car is old and tired but perfect if you want the barn find look. The car has both tops. Soft top looks to be original and has a very cloudy and cracked rear window. Hardtop is in good shape. Doors open and close fine and the windows roll up and down. All glass is good. Blue interior appears to have been done in the early 1980’s and is exhibiting wear in places most notably the bottom of the drivers seat. All gauges work except the oil pressure gauge which reads high. Original AM/FM radio still turns on but the power antenna is missing. The engine was changed out with what appears to be(according to the notes and receipts) an LT1 in 1974. The engine was bought new in pieces from Fitzpatrick Chevrolet here in Concord and assembled by a local machine shop. The original 4 speed transmission was swapped out for a Super T10 4 speed. The car starts and runs good but could benefit from tuneup as it has a slight hesitation at mid throttle. The wheels were put on when the flares were in the late 1970’s. Tires are recent as is a master cylinder rebuild, thermostat and aluminum radiator. I had the car checked out by a Corvette specialist and these are his observations: The Corvette has all original body panels with original bonding strips and glue, The frame is a cherry original with no rust or repairs, the rear is a newer style with larger diameter half-shafts, excellent car with a very easy to repair body (flares). The car goes down the freeway fine and is a blast to drive. Currently registered with a clean California title. Fast car!